Halos can be seen all the year round from the tropics to the poles. 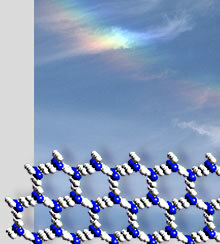 Ice crystals in cirrus clouds produce them. The clouds are 3 - 6 miles (5 to 10 km) high and are always cold regardless of their location. In very cold weather halos are also formed by crystals in air close to ground level, called diamond dust. Ice crystals behave like jewels. Sunlight passing between their faces is refracted and reflected to send shafts of light in particular directions. Halos are the collective glints of millions of crystals. 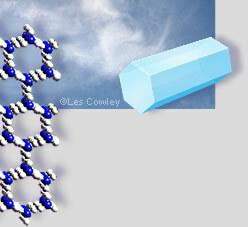 Regardless of their overall proportions, all ice crystals have identical interfacial angles. It is this constancy which gives regular and predictable halos. Why are the crystal angles always the same? The constancy comes from a deeper order at a molecular scale. In ice, individual water molecules are linked together and arranged in a regular lattice. This submicroscopic order and symmetry gives us the halo forms and symmetries of the skies.